Halloween is many a makeup artist's dream festivity. Creativity runs amok and everybody is trying to outdo each other in coming up with the most whimsical and surprising look for the occasion. 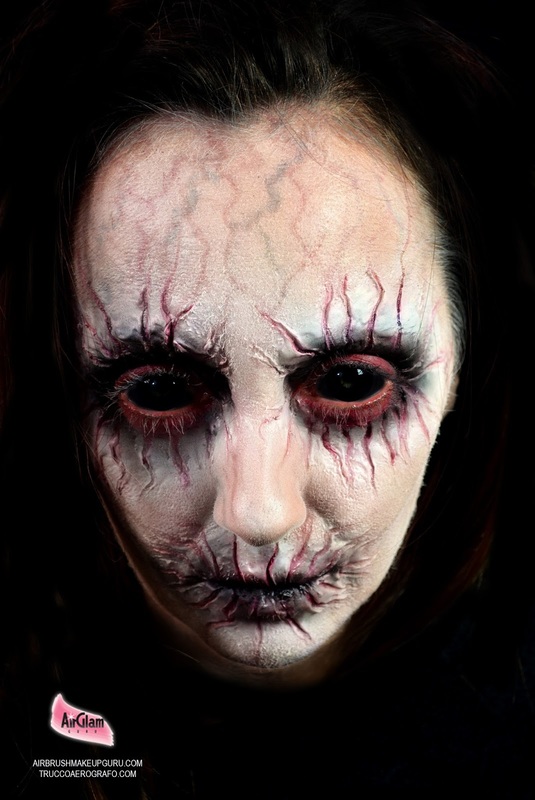 Some newbies might even feel intimidated at times, but the industry nowadays is supplying us with so many amazing products that literally anyone can create a frightfully good makeup without too much effort. Like every year we turned to our favorite online store in the world, Camera Ready Cosmetics, to put together the look you see in these photos and video tutorial. If you follow these pages you might have read our previous Camera Ready rave review of a couple of years ago. Since we wrote it the business moved to a new location in Dallas, Texas, and grew exponentially under the guidance of their amazingly talented founder and owner, makeup artist Mary Erickson. They now stock about twice as many brands, have lowered their shipping costs and continue with their policy of unrivaled customer service. Much to our delight, they stock an extensive catalogue of airbrush products and special effect supplies, and they ship all over the world at fair prices when many of their competitors still hesitate to do so. 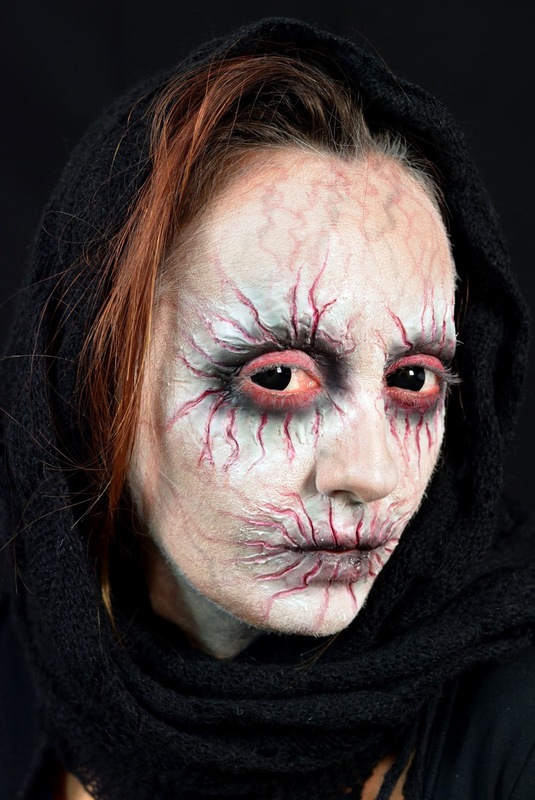 Let's talk about some of the products we used in our demo, hoping that what you see and read here will inspire you to get creative for Halloween 2017! This amazingly versatile product is made of two components that must be mixed in equal parts. It is extremely easy to blend on the skin and can be cleaned up and smoothed out while still curing with 99% alcohol. It will cure in about 5 minutes, so be sure to work fast. Also be very careful not to cross contaminate the jars when extracting the product, or you may render it unusable. This product is available in various colors. We had the clear version which can also be easily colored intrinsically by mixing pigment in powder form. Once cured the application will look very shiny, but it can be painted easily and blended perfectly. a small amount of alcohol or activator in your airbrush cup and then "tint" it by dipping a brush into the palette's well and then "rinsing it" in the airbrush reservoir. It is a simple process that is quicker to do than to describe, and require minimal experimentation in order to achieve the right color intensity. If you don't want to do this, you can also order the same colors you find in the palettes in a liquid format that is ready to be airbrushed. EBA is another brand that is becoming an industry standard in the SFX world, with outstanding lines for airbrushing and solid palettes. We used Endura Airbrush Liquid (alcohol based) in white to prime the face and get rid of the silicone compound's shine, then some flesh tone and some straight black to finish the makeup. EBA also offers Endura Vibe, a line of water based colors of extraordinary pigmentation and water and rub resistance. So you finally saw me using a brush or two, and these could only be coming from the amazing SFX collection by Bdellium Tools, a vegan product created especially to achieve amazing pictorial textures. These brushes are another industry favorite, and if you look hard enough in related videos, you will see them being used by the very best artists in both the beauty and the special effects fields. We fully reviewed this beauty in a previous post that you can read in our Kits Reviews page, and we are happy that CRC is still stocking this beauty!